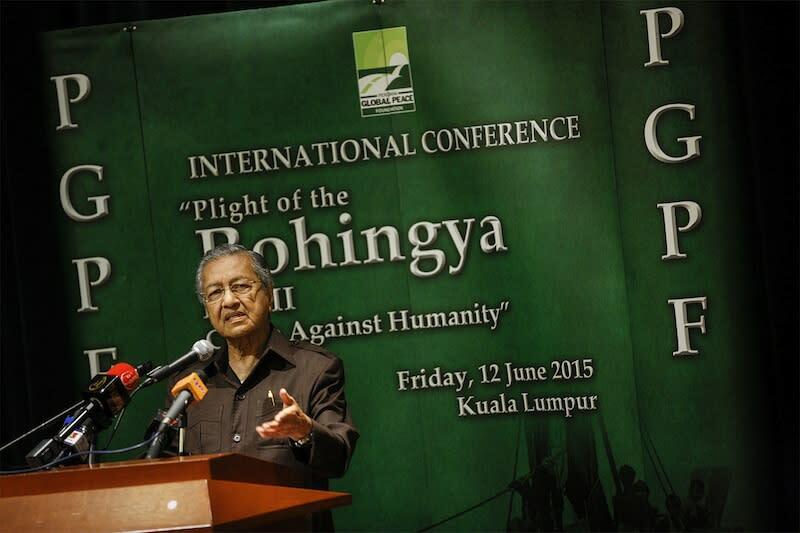 KUALA LUMPUR, June 12 — Tun Dr Mahathir Mohamad urged Malaysia today to intervene in the state-sanctioned discrimination against the Rohingya in Myanmar that the former prime minister dubbed as “genocide”. In his keynote address at an international conference titled, “Plight of the Rohingya Part II — Crime Against Humanity”, the former prime minister also urged other Association of Southeast Asian Nations (Asean) countries to discard their non-interference policy on the matter, after thousands of Rohingya and Bangladeshi migrants were recently stranded at sea. “It’s not a boat problem. This idea of not interfering should have a limitation,” Dr Mahathir said in his speech to a packed audience. “It may be internal, no country should have the right to treat their people this way. It is genocide. We must interfere beyond a certain limit. We demand Asean discard non-interference. “Change our minds about sanctity of independence. Malaysia should take this up with Asean. We cannot have a country that commits genocide in Asean. We have to interfere,” he added. Dr Mahathir also urged the Asean community to raise Myanmar’s persecution of the Rohingyas to the United Nations (UN) and called for the country to be ostracised. “We can bring this up in UN...not that they are capable of doing anything. “This country needs to be ostracised,” he said, referring to Myanmar. Migrant activists estimated then that apart from the first 1,000, some 8,000 Bangladeshi and Rohingya continued to remain stranded at sea after people smugglers abandoned ship following a Thai crackdown on human trafficking. On May 17, international newswire AFP reported diplomats and analysts as saying that Asean’s pledge of non-interference and its failure to curb Myanmar’s systematic abuse of the Rohingya — who suffer state-sanctioned discrimination and are denied citizenship despite having lived in Myanmar for generations — have contributed to the migrant crisis in the region.